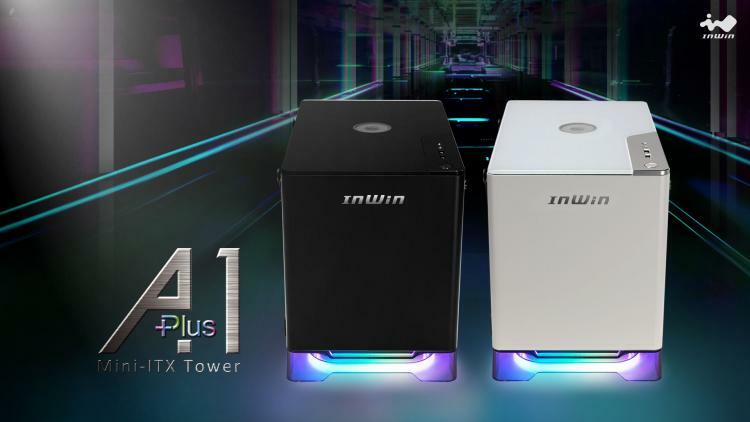 InWin presents the new A1 PLUS mini-ITX chassis featuring addressable RGB lighting, support for high-end graphics cards such as the AMD Radeon VII and NVIDIA GeForce RTX Series, and a built-in 80 PLUS Gold 650W power supply. The InWin A1 PLUS also features a tempered glass panel, solid steel structure, and anodized aluminium components. The A1 PLUS features a specialized graphics card holder that supports heavy high-end graphics cards of up to 320mm in height. The A1 PLUS has a compact 20-litre volume which supports CPU coolers of up to 160mm tall and two 2.5-inch drives to create a high-performance mini ITX gaming PC. The InWin A1 PLUS mini-ITX chassis sports an upgrade Qi Wireless Charger with WPC Qi 1.2 support that’s built-in on the top panel of the chassis where users can conveniently place Qi Wireless Charging-enabled phones and devices of up to 10W of power. The A1 PLUS’ Qi Wireless Charging pad works even when the PC is turned off. The chassis also sports a high-speed USB 3.1 Gen1 Type-A port on its front I/O panel. The InWin A1 PLUS comes with 2 pre-installed SIRIUS LOOP 120mm addressable RGB fans which can be controlled using the included RGB controller or connected to the motherboard RGB header for synchronized RGB lighting using motherboard RGB software. The chassis also comes with an addressable RGB LED strip as underglow element. No information on pricing and availability as of this writing. Learn more about the InWin A1 PLUS chassis here.